Do you ever feel like no matter how much you get done in a day, your to-do list keeps getting longer and longer? Sometimes we pile on the to-do’s so high on our plate, we can’t even muster the energy to get one thing done. Meanwhile, new tasks are still piling on and there is no amount of caffeine that is going to get us to power through it all. What can we do then? Developing the skill of evaluating what to do now, what to do later, what to hand off and what to not to do at all is crucial to being able to grow your business – and yourself. Not to mention staying at least halfway sane, having time for a partner, spouse or kids and that thing called living. I am part French and there they say they “work to live” not “live to work” like we do in America. There is something to that! For example, I was invited speak at 300 person conference for women entrepreneurs in Johannesburg, South Africa. It would have been amazing and visiting South Africa is totally on my bucket list. I was already fantasizing about meeting fantastic women from all over the African continent and on a safari with my two boys. But the date of the conference also happened to coincide with back to school for my boys, and when I was gearing up for my next Masterclass and planning for the Million Dollar Women Summit. A tough one. I spent days torturing myself over what to do and finally took a deep breath and wrote the “no thank you” email. But once I did, I knew it was 100% the right choice for my business and my family. And there is always next year! Sometimes saying a thousand no’s is what enables you to protect your big YES. My big YESes are my kids, Masterclass and the Summit. What are yours? No business owner is immune to overwhelm. Ok, I’m sure you’ve felt the stress of having several tasks in front of you that are ALL important, but you know you can’t do them all. You know your time is valuable. It’s imperative to focus on the right things at the right times. But how do you know that you’re focusing on what will advance you toward your goals every day? Whenever you get stuck on anything in business, meditate on your “why.” Meaning, think about why you started your business in the first place. Once a year I take myself on a two day retreat and write out my Vision and Mission. I keep this close at hand all year (including an image of it in my phone for easy access) and it always helps me reconnect with my purpose in stressful times. You can use your Vision and Mission statement to cross check your to-do list and make sure it supports your why, allowing you to clear up some space on your plate. What is your version of South Africa right now? Is it being class mom this year? Or taking on that client who is hiring you to do something that is not what your business usually does, thus distracting you from your main services? I suggest using this filter to evaluate opportunities and new projects before you say “yes” and this alone will help you avoid overwhelm and feeling stuck. 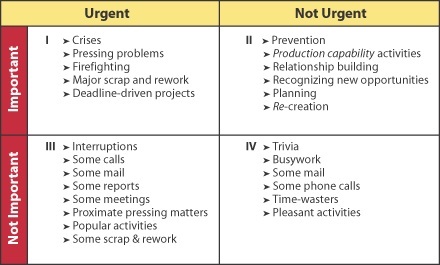 I am a fan of Stephen Covey’s prioritization matrix, also known as “Urgent Vs. Important.” It’s helpful to categorize the things on your list according to his four quadrants (Urgent/Not Urgent, Important/Not Important). Sometimes we are spending all our time in Quadrant I, doing things that are Important and Urgent, and missing out on opportunities to do things in Quadrant II like sign up for a conference where you’ll meet more clients, learn how to raise capital, or hire someone fantastic for your team. Tasks that are not urgent and not important can delegated or removed from your list (“Talk to the hand”). Tasks that are important, but not urgent can get your attention later. Tasks that are urgent but not important can be outsourced. And tasks that are urgent and important need to take up a good portion of your day, but you can’t always be putting out fires or your business will not grow. Did you make a strategic plan in the beginning of the year, or do you use 90-day plans? If not, consider my online Masterclass, where you’ll receive expert guidance in creating a solid strategic plan. If you already have a plan, when you feel overwhelmed, that’s the time to look back at it and see if what you’re doing day-to-day aligns with the plan. Again, doing this will ensure you’re focusing on the “right” projects and tasks that support your plan to hit your goals. It will also help you see clearly what NOT to do as well. If the projects and tasks don’t fit in with your plan, you’re likely to get off track with reaching your goals. Using a 90-day plan is one of my favorite strategies. Whenever I am feeling overwhelmed, I pull mine out and make sure I am focused on my Top 4 Priorities. You can read this post for a full breakdown of how (and why) they work. You can also download my 90-day plan template here. Studies have shown that 90 days is the perfect amount of time for planning because it’s far enough out that you can be “aspirational” but it also provides you with enough time to actually accomplish significant goals. Plus, every quarter has 90 days. So if you start on January 1st or any of the first of the quarter days (April 1 or July 1 or October 1) you’ll be aligned with the most common fiscal year for companies (January 1 – December 30th). What is the 20% you should be working on? Have you heard of the Pareto principle, or the 80/20 rule? The rule is that 80% of our impact comes from 20% of the effort. It’s also true that 80% of our sales usually come from 20% of our clients or customers. We often busy ourselves with 80% of the work that won’t make an impact on our businesses (because it’s easier to tackle), when we should be focusing on the 20% that will make an impact. For example, sometimes it’s easier to respond to emails than it is to work ON your business like hire a coach, sit down with a mentor, or create a strategic plan. When it comes to finding your focus and beating overwhelm, there is no magic bullet but these tips have always helped me – and I also highly recommend going for lemon drop martinis! P.S. My online course will help you do all of this and more; the next round of Masterclass starts soon and has limited space. To book a FREE 45-minute Accelerate Session with me, and see if Masterclass is right for you, sign up here now before they’re gone.